I was fortunate to be in North Korea for the birthday celebration of Kim Il Sung. On this day, I went to the Kumsusan Palace of the Sun, where the embalmed bodies of both Kim Il Sung and Kim Jong Il are on display in glass boxes. After a lengthy security check, I was escorted through the interior of the massive palace and into each room containing the leaders. Each room was protected from dirt by a vacuum corridor which I walked through on my way into the room. The rooms were illuminated by dim red lights, and lying in the middle of each room was one of the leaders - their bodies perfectly preserved, and in plain view inside a glass coffin. I was put together by a guard with a group of 3 other people, and the four of us were led around the coffin, where we bowed deeply on each of the four sides. After departing the rooms with the bodies, I was given a tour of the rest of the palace, which contains the rooms full of medals and awards given to each leader, as well as a few of the leaders vehicles. Vehicles on display include a boat, a train car, a golf cart, and a couple black mercedes limos. I was fortunate to be in North Korea for the birthday celebration of Kim Il Sung. 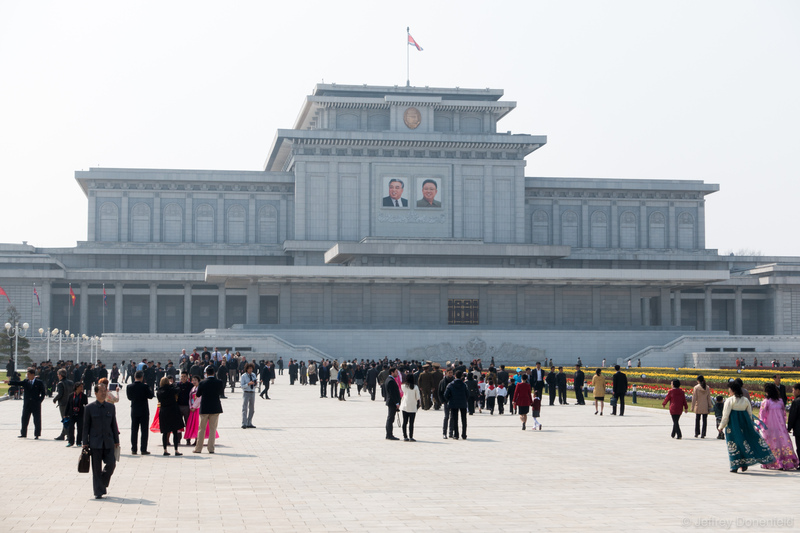 On this day, I went to the Kumsusan Palace of the Sun, where the embalmed bodies of both Kim Il Sung and Kim Jong Il are on display in glass boxes. After a lengthy security check, I was escorted through the interior of the massive palace and into each room containing the leaders. Each room was protected from dirt by a vacuum corridor which I walked through on my way into the room. The rooms were illuminated by dim red lights, and lying in the middle of each room was one of the leaders – their bodies perfectly preserved, and in plain view inside a glass coffin. I was put together by a guard with a group of 3 other people, and the four of us were led around the coffin, where we bowed deeply on each of the four sides.